I finally got around to updating my wife’s Google business listing this weekend, which has now been converted to the new/modern management center. 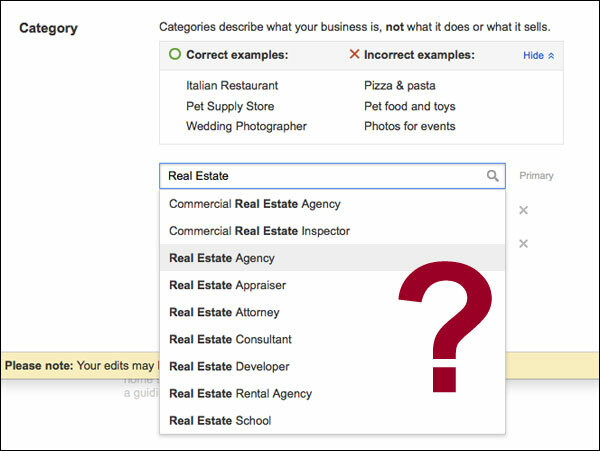 In the process of updating, Google wanted me to change categories … but I couldn’t choose “Real Estate Agent,” which is what she is, and what people in her line of work have been called forever. But no, not an option. Instead, I had to go with the next closest thing: Real Estate Consultant. I don’t think I’ve ever heard that phrase to describe this group of professionals. And I’ve been around them my whole life — my dad and sister are/were also real estate agents. Very frustrating, Google. Very frustrating. And yeah, not a fan of the word “consultant” at all, at least not in her case. Yeah, the “Real Estate Agent” category disappeared in the updated Local dashboard. Thankfully, most IYPs still have the real estate agent category so that should help Google properly categorize the listing- as Phil noted. So funny that you posted this today Matt. I JUST setup a new listing for an agent I am working with this morning and ran into the same problem. I went ahead and chose agency and consultant since neither were exact, but ultimately they were the closest option available. This is interesting as my husband (a California-licensed REALTOR/Agent) has had me use ‘consultant’ in his website and social media since he started in this business earlier this year. Apparently, at Coldwell Banker at least, consultant is an accepted and popular term for their agents. I was annoyed with this as well. Duh!!! I chose “Agency” because …the legal term for the relationship with clients is “agency relationship.” And I’m PART of an Agency. lol. So..